Mark Kokavec, who studied both Automotive and Product Design at the College for Creative Studies in Detroit, has more than 12 years experience and designed footwear for Reebok, Converse and Under Armour. 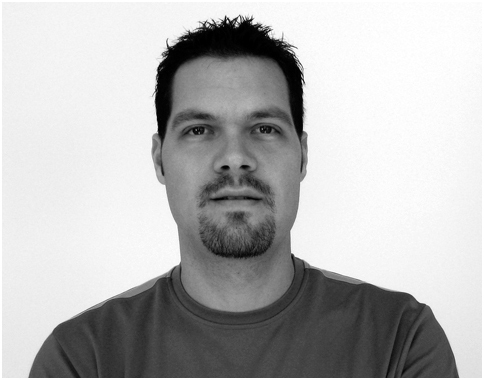 He currently works at Under Armour as a Senior Footwear Design Manager for the Running and Outdoor categories. 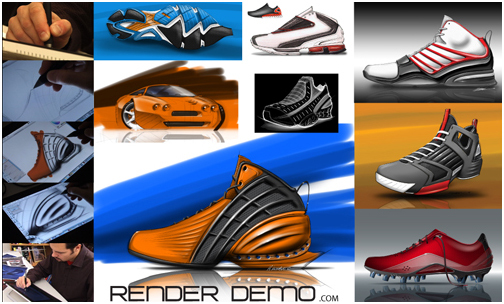 In 2008 he founded Render Demo Design Studio and is publishing DVD video tutorials to educate designers and artists to sketch and render footwear in Illustrator, Photoshop and Alias Sketchbook. Mark will be hosting two workshop sessions featuring Adobe Illustrator at the IDSA Northeast District Conference during March 27-29 in Cambridge MA. First, thank you Mark for taking the time to provide the very first interview here at Product Design Hub. Could you please tell us a bit more about your background, what made you become a footwear designer? Thank you for allowing me to share my experiences with your readers! My path in becoming a footwear designer started at College for Creative Studies in Detroit Michigan. I had studied Automotive Design for a couple years and transitioned into Product Design in an effort to broaden my design skills. I had always been interested in footwear and was one of the first students to sign up for interviews when Reebok came on a National recruiting search. I was the lead designer for their Tennis category which I have a strong passion for. I was able to design product for Venus Williams, Michael Chang, Andy Roddick, Patrick Rafter and many more professional tennis players. After 6 years I moved to Converse in an effort to build their basketball division. I worked very closely with Chris Bosh, Kirk Hinrich and more importantly… Dwyane Wade. I designed all the Basketball footwear leading up to his first signature shoe, which I helped manage and develop. After 3 years I was approached by Under Armour to help build the footwear design group. I was the 2nd Footwear designer for the company. I currently head up the Running and Outdoor categories. Could you describe your design work flows and tools? I have gone completely digital! From concept sketching to final design renderings. Everything is done digitally using an Apple MacBook Pro, Wacom Cintiq, monitor and programs Photoshop, Illustrator and Sketchbook Pro. I’m inspired by many things but my main sources of inspiration come from the Automotive and Motion Picture Industries. I really like the aggressiveness of sports cars, especially BMW, combined with the creative imaginations of artists in the entertainment industry really inspire me. What is your own most favorite design and why? The design I am most proud of is one that I created at Under Armour™. 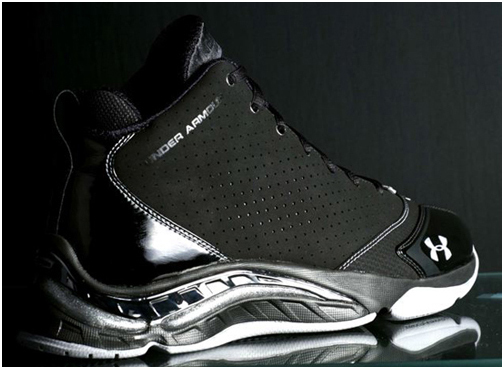 It is the first basketball shoe for Under Armour and will not be sold at retail. It’s exciting because it’s the first shoe for them and the fact that you can’t buy it really makes it special. 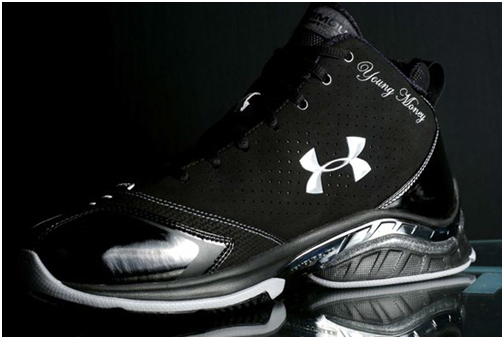 An up and coming rising star named Brandon Jennings has been wearing it. That’s a tough one! 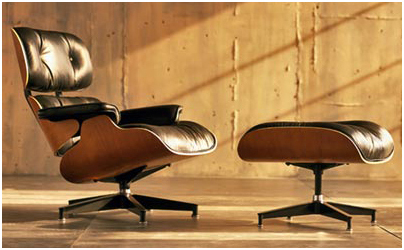 I really like the Eames Lounge Chair and Ottoman. What intrigues me most about the Eames brothers was that they were always on the cutting edge of design and pioneered many innovative technologies which we commonly use today. This chair is next on my list to purchase for my office. What are the pros and cons of being a footwear designer? There are many pros. Quick product turn-around times. You’re always working on a new project since it takes around 15 months from sketch to retail, and you have 4 seasons of launch dates. Once you start a new project, you’re in the middle of a previous season and you’re finalizing the one before that! The designs change with fashion so it’s always fresh. If you’re in the athletic industry, then you have the opportunity to meet with professional athletes and design performance type product specific to a sport. You’re able to cross over into different categories which have different standards and product specs. For example if you design football cleats and transition into outdoor, the shoe proportions change along with constructions and other subtle details. You get to travel around the world depending on the category your in. All ages can potentially wear your designs, from adults to kids! Most times you have total control over your own projects. You get to see them through from concept stage, material and color selection, all the way to working with the factory on manufacturing. It has a huge influence on my lifestyle. I head up the Running and Outdoor footwear design categories, which enables me to run in my own designs. I try to run as much as I can in different shoes so that I can better design the next round of shoes. I have way too many shoes in my closet (as does my wife!). Where do you think the future of footwear design is heading in the next 5 years? I see a total digital and 3D future. Some of us are already there and sketch right into the computer. It’s faster, and it will speed up the process and we will be closer to the market. What can we expect from Render Demo Design Studio soon? -A new redesigned website will be launching soon! -A few new DVD’s that teach the basics of design. I will be demonstrating everything on paper where my previous videos were mainly screen captures. This will allow the viewers to actually see how I hold a pencil, rotate the paper, make mistakes, etc. It’s more or less a hands on approach. -We are also looking for designers to submit their work in sort of a competition like format where I and other industry leaders will be voting and selecting the best ones for a book launch. The designers whose work is selected for the book will receive a free copy! Each designer will have their contact information included so this book becomes a reference for companies. It’s kind of like a resume. It will give them a worldwide exposure. Thank you for this interview, any last words or tips you want to share with upcoming footwear designers? Whatever field you’re in or studying for, remember that passion is key! If you don’t have a passion for what you’re doing right now, STOP! Figure out how you can do what it is you’re passionate for. Never stop trying and never let someone else tell you that you don’t have what it takes or that you’re not good enough. This was fun! I look forward to reading future interviews from other designers.